Max Ehrmann shared that bit of advice in his overwrought and over-read 1927 poem “Desiderata,” though I'm not ashamed to admit that I long thought it was wisdom directly from the mind of Leonard Nimoy (Update: The late, great Leonard Nimoy, that is). If Roberto (Jean-Louis Trintignant), the younger of the two protagonists of “Il Sorpasso” (1962), had heeded Spock's, I mean Ehrmann's counsel, he would probably be a lot better off today. But he also would have missed out on the most exciting time of his life. The terminally shy law student takes a break from his books to look out the window of his very neat and very lonely apartment and what does he see in the street below but his very own manic pixie girl, albeit one with an unusually deep voice and hairy chest. Bruno (Vittorio Gassman), the forty-ish stranger who has just pulled up in his car, bellows out a greeting to young Roberto because Bruno is all about making noise; he's even had the horn on his shiny Lancia Aurelia adapted to make the extra obnoxious sound he requires so that the whole wide world knows he is present. He will honk that damn horn over and over and still over again throughout the movie, and it's a sound you are unlikely to forget no matter how much you might want to. Unable to find anything to do (or anyone to annoy) on a lazy holiday, the bored and restless Bruno rescues Roberto from his solitary studies and whisks the pliant young man off to a series of adventures on and alongside La Via Aurelia, the road that leads to and away from Rome. A short trip for a quick meal extends into an epic journey as director Dino Risi, loosely inspired by a few real-life acquaintances and co-scripting with future director Ettore Scola and veteran writer Ruggero Maccari, sends this tailor-made odd couple careening through the coastal towns of Tuscany over the course of a day and a night and the next day en route to perhaps the most popular Italian road movie of all-time. As in many road movies, the highway is the thread that loosely connects a series of disparate episodes that provide an excuse for the mismatched characters to get to know each other. Bruno is a perpetual motion machine whose engine revs as high as his Lancia Aurelia, a car whose exclusive function is to pass every other car on the road (“Il Sorpasso” loosely translates as “passing” or, in this case, the need to pass everyone to prove your masculinity). He is equal parts charming rogue and infuriating loudmouth, and would surely be an insufferable companion in real life, but Gassman imbues him with an undeniable charisma thanks to an intensely physical performance (Bruno struts and preens with the best of them) leavened with surprising moments of self-awareness. Every now and then the self-absorbed hedonist catches his reflection in the eyes of his companions (including the estranged wife who tired of his act long ago) and sees just how absurd he looks. Not that it will make him change, mind you, but the recognition lends him an endearing touch of sincerity and complexity. For his part, Roberto gradually loosens up and learns to enjoy himself under the tutelage of his mentor and de facto surrogate father figure. That's the most formulaic development in the film, but far more interesting is the way that Trintignant embodies the frustration of an introvert exasperated by the way the world so eagerly embraces a hyper-demonstrative blowhard; the ladies (including one Roberto has loved for a long time) swoon in Bruno's presence and all the men instantly want to be his best friend. All rules are made to be broken when good ol' Bruno's in town. Roberto seethes at the outpouring of affection he has never received thanks to his timid manner, but still grows to care for and even admire his new friend. Still, alpha dogs don't live to help the runts of the litter, and every minute in Bruno's presence is an ongoing peril for the meek young student. Better not to ask what's around that next curve and just enjoy the moment. As wispy as the narrative might be, “Il Sorpasso” gains heft from a vividly evoked sense of time and place. Risi, who cut his teeth in documentary filmmaking, and cinematographer Alfio Contini race along to keep up with the boys and their propulsive car, but the camera often stops to catch a glimpse of the lives of one of the characters lurking in the background. Sure, many of these characters happen to be the exceptionally well-endowed women who miraculously populate the night clubs and sun-drenched beaches of the film, but we also get a taste of the way that working-class Italians enjoying the post-war “economic miracle” spend their free time. The story is universal, but it could not have been filmed anywhere (or anywhen) else. A caricature like Bruno comes more fully alive when anchored to such a concrete milieu, and the movie's time-capsule quality only adds to its enduring appeal. Since we're talking about Italian film it's obligatory to state that this comedy still displays the residual signs of neo-realism, though it's just as possible that Risi simply liked to pay close attention to the people and places around him. The film is presented in its original 1.85:1 aspect ratio. The highway stretches vertically (vroom vroom honk! ), but the beaches and other countryside location sprawl horizontally along the wide-screen frame. This 1080p transfer provides the expected sharp level of image quality. I felt that in some of the whiter spaces (the hood of the car or the brightest patches of sun) there was a bit of digital noise, perhaps from boosting, but it's a minor matter. The black-and-white contrast is strong and the rich grainy structure is well-preserved. This is a dual-format release with two DVDs (one with the movie, one with the extras) and a single Blu-ray. The DVD transfer has not been reviewed here. The linear PCM Mono audio mix is fairly simple and straightforward. I didn't hear any distortion or other weak spots in the audio. Optional English subtitles support the mostly Italian dialogue. 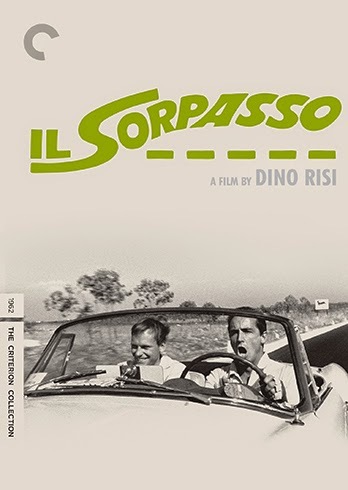 You might not think of a road comedy like “Il Sorpasso” as a candidate for a deluxe treatment, but Criterion has absolutely loaded this release with extras. A Dino Risi interview (2004, 20 min.) conducted by critic Jean A. Gili catches the 88 year-old director (who passed away in 2008) in a nostalgic mood as he discusses the making of the movie. An excerpt (1983, 9 min.) of actor Jean-Louis Trintignant introducing a screening of the film on French television is fluff, but still neat. A new interview (2013, 14 min.) with Ettore Scola, the future director who co-scripted “Il Sorpasso,” provides more context about Italian comedy filmmaking in the '60s and his development of the character of Bruno as well as the movie's ending. The most analytical extra is an interview with film scholar Remi Fournier Lanzoni (2014, 16 min.) who contextualizes the film both in Risi's career and within the context of Italian society where “the art of getting by” is an official national concern. “Back to Castiglioncello” (11 min.) is an excerpt from a 2012 documentary that returns to the beach town that provides the setting for much of the film's second half. I think you have to be familiar with the area or a really big fan of the movie to get absorbed by this, but at least it's there. “A Beautiful Vacation” (55 min.) is a 2006 documentary by Fabrizio Corallo and Francesca Molteni. It was shot for the occasion of Risi's 90th birthday, and includes interviews with the director as well as other collaborators; I only had a chance to skim through it and it seems heavily anecdotal. “Speaking with Gassman” (31 min.) is a 2005 documentary by Marco Risi (Dino's son) which includes interviews with the director along with archival footage of Risi and actor Gassman (who died in 2000). They shot 16 films together and were friends in real life. They also apparently competed with each other for the affections of the ladies. I'm not normally interested in celebrity gossip, but this is probably the liveliest feature on the disc. 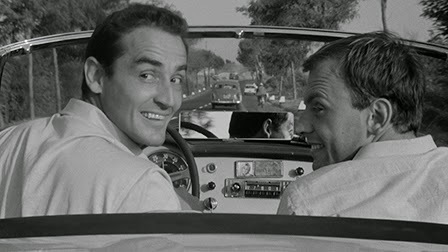 “Il Sorpasso” was a big hit with audiences both in Italy (where it was the top grossing film of 1962) and abroad, and remains a popular film five decades later. With two strong lead performances and its deft balance of comedy and tragedy, its appeal is still obvious today. Criterion has gone all-in with an ample collection of extras along with a typically strong high-def transfer that gives this sterling example of commedia all'italiana the grand treatment.